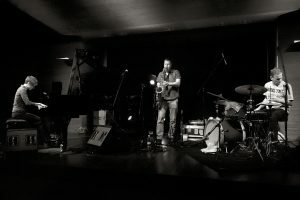 DEK in a new improvised music trio that features Austrians Elisabeth Harnik (piano) and Didi Kern (drums), and American Ken Vandermark (reeds), who have been performing together since September of 2014, both in Europe and in the United States. 2016 has been an exciting year for the band- in January they were featured as part of Vandermark’s residency at the Stone in New York City, and in autumn they released their first album, called “Burning Below Zero,” on the Trost label, which received a 4 star review by The Free Jazz Collective. Their music has a wide range of influences: sources based in Harnik’s work as an internationally acclaimed new music composer, Kern’s profile on the European underground rock scene, and Vandermark’s two decades of work at both home and abroad, touring, recording, and collaborating with dozens of world renowned musicians as diverse as Getachew Mekuria and John Tilbury. The combination of these diverse backgrounds and open-ended musical curiosity has developed an extraordinary group aesthetic- inclusive, expressive, and instantaneous. Elisabeth Harnik: free-lance composer and pianist, was born 1970 in Graz and lives in Gams (County of Styria/Austria). She studied classical piano and later – with Beat Furrer – composition at what is now the University of Music and Performing Arts, Graz. The „repertoire“ and it´s extensions in composition and improvisation is her central focus. Harnik works within an electro-acoustic inspired sound-world, using unique preparations and extended techniques. Easterfestival Graz, Hörfest Graz, Styrian Chamber Music Festival, Munich Opera Festival, Composers’ Forum Mittersill, Festival 4020 Linz, Soundings Festival London, Opera Graz, Musikprotokoll/Steirischer Herbst, E_MAY Festival Vienna, Klangspuren Schwaz, Transart Festival Bozen, Wien Modern, Estonian Harpsichord Society Festival, a.o. She has worked with renowned artists and ensembles such as the Ensemble Zeitfluss Graz, the Ensemble 09 Linz, the Ensemble MusikFabrikSüd, the Radio Symphony Orchestra Vienna, the Klangforum Vienna, the Ensemble “die reihe“ Vienna, the Ensemble Kontrapunkte Vienna, the ensemble Reconsil Vienna, the Ensemble PHACE Vienna, the Ensemble Platypus Vienna, the Haydn-Trio-Eisenstadt, the Trio AMOS Vienna, the Trio EIS Vienna, the Thürmchen Ensemble Cologne, the Fidelio Trio London, the Cantus Ensemble Zagreb, the Ensemble mise-en New York and various national and international soloists. Harnik received a great number of rewards and prizes, most recently she was Artist in Residence at the OMI International Arts Center New York and Composer in Residence at the IZZM in Ossiach/Austria. In addition to her work as composer she appears as improvisator at various national and international festivals such as the V:NM-Festival, the Ulrichsberger Kaleidophon, the Nickelsdorfer Konfrontationen, the Artacts Festival St. Johann, the Music Unlimited Festival Wels, the Soundgrube Vienna, the Comprovise Festival Cologne, the Beethoven Fest Bonn, the A L’ARME! Festival Berlin, the Jazz & More Festival Sibiu, the Audio Art Festival Pula, the Krakow Jazz Autumn Festival, the Alpenglow Festival London, the All Ears Festival Oslo, the Umbrella Music Festival Chicago, the Okka Fest Milwaukee, the Musicacoustica Beijing, the SoundOut Festival Canberra/AUS, the Jazz na Fábrica Festival São Paulo/Brazil a.o. Besides her solo performances she is member of many ensembles for improvised music (Barcode Quartet, Plasmic Quartet, Wild Chamber Trio, DEK, ReDDeer a.o.) and has performed with numerous internationally respected musicians. She has toured in Europe, USA, China, Australia, Brazil and her compositions are performed regularly at concerts and festivals for contemporary music. Didi Kern: started to play the drums in marching bands, soon performed in rock, improvised music and techno contexts, is mainly known for his contributions in bands like Bulbul and Fuckhead. He is also a founding member of Broken Heart Collector and a collaborator with international musicians like Philipp Quehenberger, Ken Vandermark, Mats Gustafsson; and is also active in the field of riding his bicycle. Tours have taken him to places like the Royal Festival Hall / London, Museum Serralves / Porto a.m.o. Ken Vandermark: Born in Warwick, Rhode Island on September 22nd, 1964, Ken Vandermark began studying the tenor saxophone at the age of 16. Since graduating with a degree in Film and Communications from McGill University during the spring of 1986, his primary creative emphasis has been the exploration of contemporary music that deals directly with advanced methods of improvisation. In 1989, he moved to Chicago from Boston, and has worked continuously from the early 1990’s onward, both as a performer and organizer in North America and Europe, recording in a large array of contexts, with many internationally renowned musicians (such as Fred Anderson, Ab Baars, Peter Brötzmann, Tim Daisy, Hamid Drake, Terrie Hessels, Mats Gustafsson, Elisabeth Harnik, Steve Heather, Didi Kern, Kent Kessler, Christof Kurzmann, Fred Lonberg-Holm, Paul Lytton, Lasse Marhaug, Joe McPhee, Andy Moor, Jason Moran, Joe Morris, Paal Nilssen-Love, Eddie Prevost, Eric Revis, Jasper Stadhouders, Chad Taylor, John Tilbury, Nasheet Waits, and Nate Wooley). His current activity includes work with Made To Break, Lean Left, Shelter, DEK, The DKV Trio, Fire Room; duos with Paal Nilssen-Love, Tim Daisy, Terrie Ex, and Nate Wooley, as well as work as a solo performer. Since June of 2015 has been co-curator of Option, a music series held on a weekly basis at the Experimental Sound Studio in Chicago. In 2014 he began an independent label, called Audiographic Records, created to document special aspects of his work through albums and books. More than half of each year is spent touring in Europe, North America, Russia, Brazil, and Japan, and his concerts and numerous recordings have been critically acclaimed both at home and abroad. In addition to the tenor sax, he also plays the bass and Bb clarinet, and baritone saxophone. In 1999 he was awarded the MacArthur prize for music.